This Prawn Curry Recipe is a quick and easy Thai dish made in about 15 minutes. If you’re stumped about tonight’s dinner, don’t stress. I’ve got you covered with this 15-minute wonder. I think you’ll appreciate it’s simplicity, minimal ingredients, and great taste. First of all, who doesn’t love prawns. We are huge fans of most types of seafood and prawns are no exception. I was lucky to find them for an amazing deal at my favorite local Sprouts. They were on sale for $11.98 with an additional 20% off. Yes, if you could believe that. Sprouts not only had their weekly sale going on but they also had an additional 20% off select frozen good. I totally scored. Whenever I find budget-friendly deals like this on seafood. I just can’t resist. I can’t even begin to tell you how delicious this Prawn Curry Recipe is. Let me start with the red curry sauce. It’s so velvety and creamy from the coconut milk and rich in flavor from the aromatics and curry paste. Adding prawns to the mix, heightens the flavor of the sauce even more making it taste like a truly authentic dish. 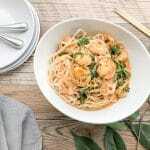 Protein: As you know, my protein of choice for this recipe are prawns, hence the recipe title, although it can be adapted by swapping prawns for chicken. Aromatics: Most of my savory dishes are made with aromatics such as garlic, shallots, or onions. When they’re sauteed, they emit a wonderful aroma and adds a depth of flavor to every dish. Although aromatics are not required, I strongly recommend that they are used when making sauces or other savory recipes. Red Curry Sauce: Two important ingredients for a wonderful rich and flavorful curry sauce are coconut milk and red curry paste. 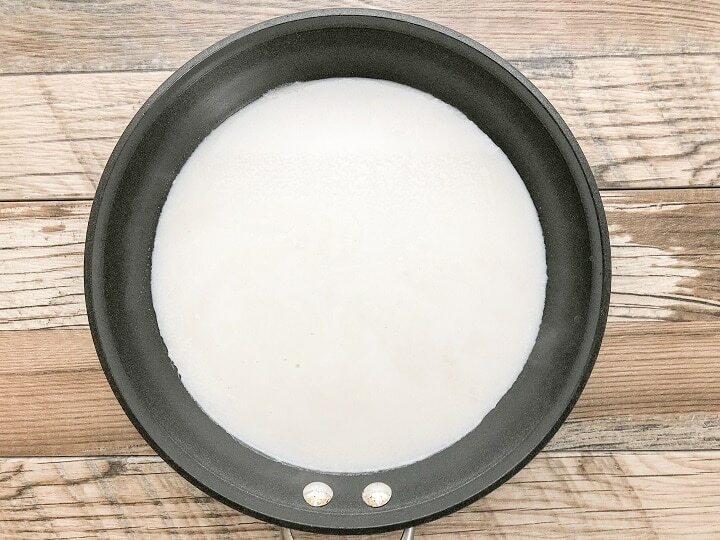 I recommend using a really good coconut milk whether it’s the full-fat coconut milk or a light coconut milk. I always use the latter as I like to cut calories and fat where I can without sacrificing taste. One notable difference between red curry paste compared to curry powder is that red curry paste is more potent than curry powder and offers a smoother and slightly thicker consistency. I personally prefer curry paste over curry powder. Although I sometime add about 1/2 tsp of curry powder to the curry paste. Starch: You can serve your Prawn Curry Recipe over white or brown rice or rice noodles. We love having it over brown rice noodles. Rice noodles are basically made out of rice flour and water and has a more delicate texture than regular noodles. They’re fairly transparent with a somewhat chewy texture. When it comes to cooking with shrimp or prawns, they must first be deveined. This is done by using a steak knife to cut a slit along with front and back side of each prawn to remove the vein and other waste. After each prawn has been properly deveined, wash the prawn several times with water. So, will this easy Prawn Curry Recipe be on your up and coming dinner menu? I’d love to hear your comments in the comment section below. If you love Pinterest or Instagram, I’d love for you to follow me. More importantly, thank you for visiting my blog. If you do not mind, would you mind rating the recipe below. 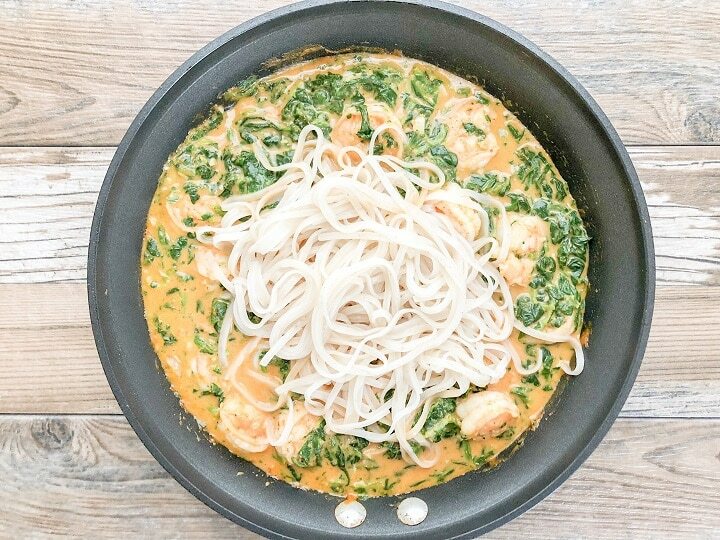 Prawn Curry Recipe is a quick, easy and delicious dish made with prawns, coconut milk, red curry paste, and brown rice noodles. Cook rice noodles according to instructions on packaging. Do not overcook. Cook for about 4 minutes, drain, and rinse with cold water to stop the cooking process. Set aside. Over medium heat, add extra virgin olive oil to saute pan. 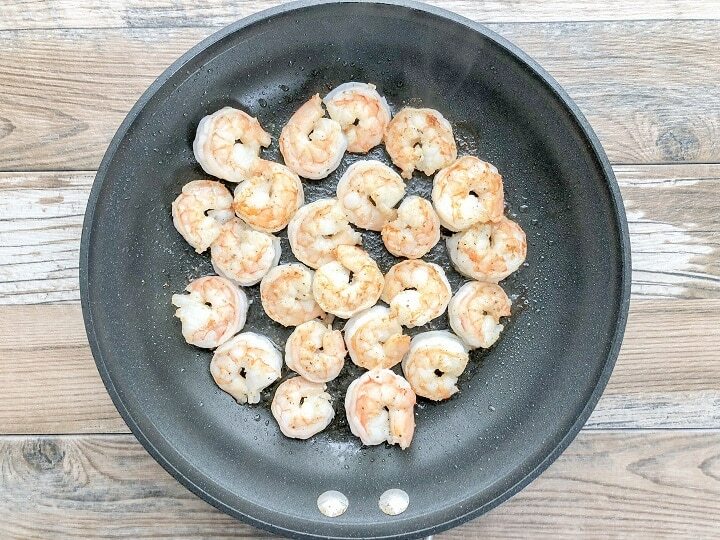 Add prawns to saute pan and cook until opaque and pink in color (about 3-4 minutes on both side)s. Do not over-crowd prawns. Cook prawns in batches if necessary. 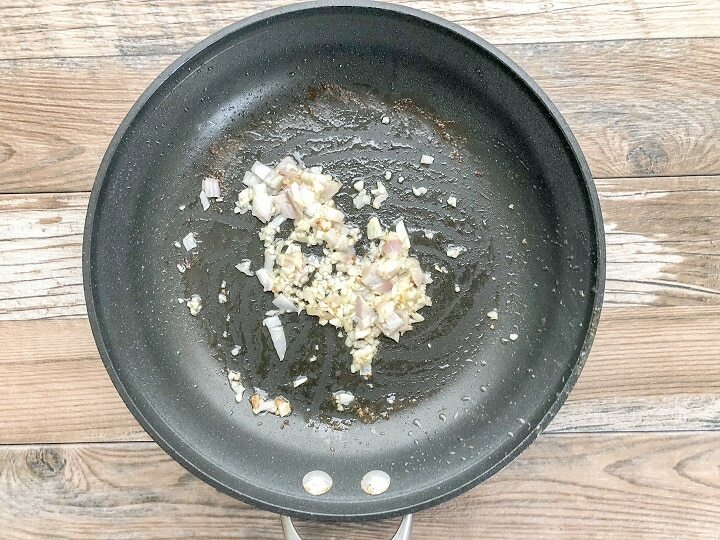 When done, place on a clean plate. Set aside. In same saute pan, add a dash of extra virgin olive oil. Add garlic and shallots and saute until fragrant. Add coconut milk and let simmer. 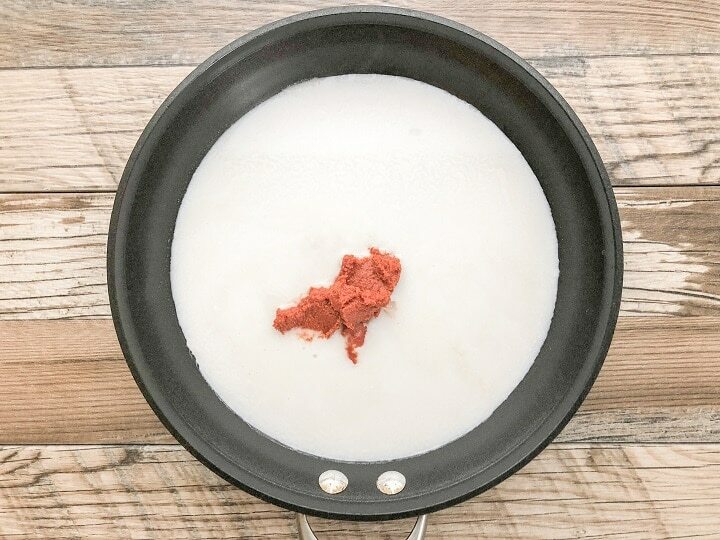 While coconut milk is simmering, add red curry paste. Using a whisk, whisk until smooth and creamy. Add salt and pepper to taste. If adding a leafy green such as frozen spinach. Defrost spinach and remove any excess water with a paper towel. Add spinach to sauce until heated through. Add prawns to red curry sauce. Add rice noodles. Toss until all ingredients are coasted in the red curry sauce. If adding a leafy vegetables, all it to the sauce and let it wilt before adding the cooked prawns.